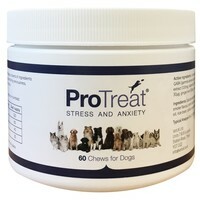 VetUK ProTreat Stress and Anxiety Dog Chews from VetUK is a supplement made from a blend of nutritional ingredients that have been put together to induce calmness in dogs. Given a delicious liver flavour, the palatable chews are perfect for dogs who are exhibiting signs of nervousness, over activity, discontentment or stress. Feed with food, whole or crumbled. These are by far the best of all the anxiety medications we have tried. I have 2 extremely sensitive dogs to loud noises, gun shots especially as we live in a rural area and it seems that every weekend someone somewhere is shooting. 1 dog is a rescue pointer from Spain and had been cruelly treated and now we are able to handle her for grooming (nail clipping etc) without her screaming as soon as touched. The other is a gun-shy pointer re homed due to not making the grade as a working dog. I have now re ordered 2 more tubs and hope that they will also help with the forthcoming Nov 5th activities. I am sure given our experience so far that some improvement will be seen. Our GSD has an eye condition which requires regular checks with the Opthalmic Vet using bright lights and scopes up close to her eyes. These treats definitely relax her enough that she can tolerate having these vital checks done. She loves the taste and happily takes them, looking for more. Well worth the price. I have an old dog who had become light sensitive so that she would flinch in bright lights/shadows and have minor convulsions if she then became anxious or confused. These chews have calmed this reaction right down and restored her quality of life (and ours too!). She also likes to take them as a treat although she is generally fussy about flavours. My 2 year old Standard Poodle was having what I named as 'psychotic episodes' when she would go wild, bark constantly, whine, throw herself around the room jumping on and off furniture. She was totally out of control. After a vet check where he suggested finding a supplement I did some research and found ProTreat. She hasn't had one of these episodes since and is generally calmer. At the moment I give them once every day as the episodes had been every day. Will have to judge at some point as to whether to change to 'as necessary'. I am thrilled. I have tried various calming treatments for my two Springers. One is petrified of bangs and all loud noises, the other is hyper. These have worked perfectly on both dogs so I am just reordering. These are not really chews, a small roll just a bit bigger than a stock cube and about the same consistency. My small dog loved it and wolfed it down in a minute. Can't tell whether it has produced any sort of calming and I would need proof before I re order as it seems expensive if just a treat. I have a rescue Border Collie we think she is about 5 years old I have had her for 3 years, she came from Blue Cross and they thought she had been beaten if you put your hand towards her she would cower down. In the house she would just hide in the bedroom all the time it took over a year for her to feel safe with us and now she is much more confident but I still have a problem with her with loud noises. I think I have tried every product on the market but nothing helped then I found Protreat she has been on them for the last three weeks and I can't believe the difference they have made, she is so much calmer and relaxed I will definitely be keeping her on these. If you have a nervous dog give them a try you will be amazed. It is nice to find a product that works really well, and more importatly, that my dog will actually eat. He gets really stressed out by fireworks and thunder and in the past we have tried various pills that we have had to try and hide in bits of cheese or meat. This was never successful as my dog can eat the treat and spit the pill out!! I am now on my second tub of Pro Treat anxiety pills and can't praise them enough. Great product, my dog loves eating them even on their own which is a big bonus as so many supplements don't taste nice at all! i use this inconjuntion with natural remedies and they seem to have really helped. I bought this because I have two Cairns who are easily upset by the noise of fireworks and it has been impossible to take them out until after midnight sometimes. Having tried an assortment of things, I had nothing to lose by spending £15 or so on a tub of ProTreat. I fed the treats to them twice a day for a couple of days before Bonfire Night, and 3 on the worst nights, and was dumbfounded to notice that they were definitely calmer about the noise. I've just bought some more to use for the occasional noise-crisis. Great service, ordered these on 27th and they arrived today 30th.My dog seems to love them, she took one straight out of my hand and then was looking for more, and she's normally so fussy. Now I know she will eat them I will be ordering more. Great, now she thinks she is having a treat instead of calming medication. Our dog gets very stressed with fireworks so always like to have something to calm him down. We tried Calmex last year but didnt really help. Have used these on 2 occasions so far and seem to calm him right down. Easy to give to him too. Would definitely recommend. Ordered this product and needed it urgently, the staff were very helpful and made sure this was processed on the same day for me and it then arrived the next day! Since using this product is has given me back the old dog I knew, all this nervous and unsettled behaviour has gone. I'm so so so happy with this product. Thank you so much VetUK. Can't wait until my next purchase! Would recommend this product to anyone who has a stressed or nervous pet. The effects on my dog were amazing and they work for all different kinds of situations. So glad I found this website and such good value for money as well. My dog Missy has always been travel sick when being in the car, I recently took her to the vets to see if there was anything that they could do about this and they recommended to use some calming tablets, there was no way I was paying them prices though. I then discovered VetUK's own brand of them and they are superb. A delicious bacon flavor which Missy absolutely loves and a good price! So glad I found these and they work wonders.